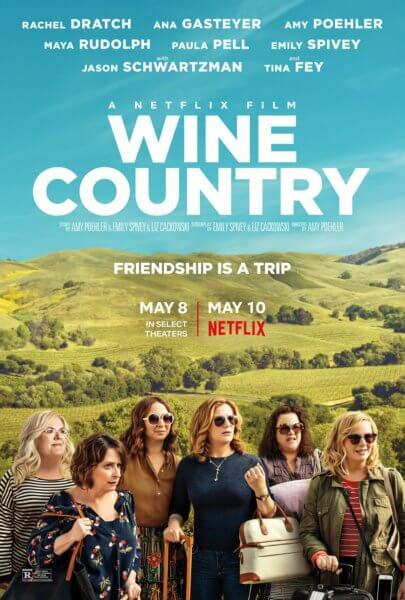 The official trailer for Netflix’s Wine Country introduces a group of old friends gathered for a fun weekend to celebrate a milestone birthday. The 2019 comedy reunites a bunch of Saturday Night Live alumni including Rachel Dratch, Amy Poehler, Ana Gasteyer, Maya Rudolph, Tina Fey, and Paula Pell. Former SNL writers Emily Spivey and Liz Cackowski co-wrote the screenplay from a story they developed with Amy Poehler. Poehler also directed and produced the comedy. The cast also features Cherry Jones, Maya Erskine, and Jason Schwartzman. The behind the scenes team includes director of photography Tom Magill, editor Julie Monroe, and production designer Keith P. Cunningham, with music by Lisa Coleman. Netflix is planning a theatrical release on May 8th followed by a global launch on the streaming service on May 10, 2019.